Steven Wilson’s latest album may be his finest and most consistent piece of work since putting the band, Porcupine Tree, on hold. Contrary to 2013’s excellent, The Raven That Refused to Sing, the vintage ‘70s prog influence takes a back seat to more contemporary stylings, sounding both more modern and, at times, more “pop” than any of Wilson’s previous solo records. Wilson reunited with his familiar solo band lineup to make Hand. Cannot. Erase., and the performances are as polished as the songwriting. The band, comprised of Wilson playing a bit of everything, but joined by Guthrie Govan on guitar, Nick Beggs on bass (and Chapman stick), Adam Holzman on keys, and Marco Minnemann on drums, are supplemented by a variety of additional musicians and vocalists here and there (including orchestra and choir). This album showcases rock performance at the highest caliber. As is customary with Steven Wilson, the album has a carefully thought out concept story line, but this is one Wilson record where you can spend less time dwelling on the mechanics and technicalities and just relax and enjoy the music. With three songs under five minutes in length, the record has songs that everyone can embrace—not just prog fans, but lovers of classic acoustic pop music in the CSNY/Simon & Garfunkel vein. And for fans of Porcupine Tree, who might have felt like Steven Wilson strayed a bit too far musically in his solo efforts, you can think of Hand. Cannot. Erase. as the Deadwing of his solo collection: an outstanding album that embraces all of the elements that make his solo music what it is, but in an more accessible and cohesive package. In our case, Hand. Cannot. Stop. Hitting. The. Repeat. Button. Nickelback is the kind of band whose global success has resulted in very polarized opinions of their music. Whether or not these opinions actually hold any relevance is up for debate, but one thing is clear: No Fixed Address is a killer rock album, and easily one of the best of the band’s career. Though it may not be a groundbreaking album, No Fixed Address throws a few curveballs into the familiar Nickelback sound that has made them so immensely popular. Catchy vocal melodies and, yes, sometimes cheesy lyrics are ever present throughout the album as always, but it’s filled with a number of groovy and heavy rock riffs. And while some of the tracks qualify as “typical Nickelback,” there are definitely standout tracks that blow the old formula out of the water. Tracks like “Get ‘Em Up” and “She Keeps Me Up” are unique in terms of the writing style as well as some interesting production choices (one thing that can’t be debated is the quality of the overall production on the album—it sounds spectacular throughout), and the anthem “Revolution” finds the band delivering a strong political message—not your typical Nickelback for sure. No Fixed Address showcases a major rock band in transition. While it’s easy to discount a few songs as just more of the same old stuff, the band took a chance on music that ranges from modern metal to pop to funk, and in every direction where they branched out, they took things to the next level. Sometimes it’s hard to let go of the past, but one thing made clear on the new album is that in the case of this band, they shouldn’t be afraid to let go of the old Nickelback, because the new stuff is awesome. If you ever liked them in the past, or almost liked them before, we encourage you to check out No Fixed Address. It’s uplifting, fun, rock with great riffs, great grooves, and great production. Your Ghost is a good reminder that Texas hard rockers are still making their mark in the music world. The album starts with heavy riffs and melodic vocals in the tracks “Virus”and “Desert” Blood, which typify the bands ability to take a familiar sounding riff and evolve it into a hard hitting musical epic. Their layered, instrumental tracks give a nice full sound to the entire album, which even includes a few cameo appearances from orchestrated violins, cellos, and some vintage keys. This is a metal band who isn’t afraid blur genre boundaries. Though their sound is definitely unique and well put together, their individual abilities aren’t showboated as much as one would think they would be in a band like this. Replacing guitar solos with breakdowns is a popular theme here, which is nice in some circumstances, but this album calls for some showcasing and acrobatics. Regardless, the vibe and presence on Your Ghost is just immense. It’s hard-hitting, close to home, and really just a fantastic listen that could make one drift away in their own thoughts while consciously absorbing the energy that the band is putting out. We love how Secret of Boris has a way of bringing their hard rock vibe down to somewhat of a psychedelic feel (in some songs) and then bringing it right back up with a fast-paced, stop-and-start anthem to keep the listeners on their toes. We’re looking forward to hearing more from this innovative band. Great work, Secret of Boris! Lonely Robot is the latest project from the mind of well known prog rock guitarist and vocalist, John Mitchell. The album, Please Come Home, is one of the most surprising albums that I have had the pleasure of listening to so far this year: it is a cinematic prog-rock adventure with dense textures and thought-provoking lyrics, often juxtaposed against minimalistic motifs and repetitive background elements. Despite the incredible writing and performances, the album is less about showcasing technical chops and more about creating an atmosphere and mood that is present throughout the album to solidify it as one whole piece. That being said, there are also parts that appeased the metal head in me that wanted to bang my head a bit (listen to the title track “Lonely Robot” if you care to indulge). Mitchell’s atmospheric approach is immediately present in the opening track “Airlock,” an instrumental piece that is seemingly minimalistic compositionally, but establishes the feel of the album through a variety of sonic elements that are strangely reminiscent of vintage science-fiction films. In tracks like “A Godless Sea” and “Oubiette,” Mitchell creates a lush world of harmony and emotional lyrics that is immersive and deep, yet there is always something simple to latch onto and call home within the composition. Driving tracks like “Are We Copies” and “God vs. Man” are disconcerting and epic with more of a hard rock/metal feel, and they create an entirely different soundscape and tone while maintaining the overall cinematic element. The album features Nick Beggs on bass and Craig Blundell on drums, with guest appearances from Steve Hogarth of Marillion, Jem Godfrey of Frost* (Mitchell’s bandmate in that superb group), and more. Overall, Please Come Home is an incredible, melodic progressive rock release that is sure to appeal to a wide range of music lovers. It needs to be heard to be truly understood, so treat yourself and pick up a copy! Wow! Big Music is a great title for the sixteenth studio release from Scottland’s finest musical export, Simple Minds. We’ll go so far as to call this one of the top five albums of the band’s illustrious career, deftly blending post-modern, EDM, and rock with their ‘80s new wave roots. The result is a fantastic record that sounds both fresh and familiar without sounding retro. Singer Jim Kerr sounds as strong as ever, and Charles Burchill lays down fantastic guitar melodies and lead lines with his trademark effected style and impeccable use of space. This is the guy who perfected the art of weaving guitar lines in and around dense layers of keyboards and synths, supplied by Andy Gillespie, who must have quite the analog synth collection to augment his modern sparkly sounds. Distorted synth bass lines abound. Renowned drummer Mel Gaynor is ever present, blending his trademark acoustic drum work with electronic loops. Bassist Ged Grimes is the relative newcomer to the band, only with them for the past few releases and tours. Together, the current chapter in the book of Simple Minds is a fabulous one. If you want to listen to expertly crafted, modern pop music, look no further. Key tracks? Hell, we can’t even begin to pick a favorite here, but the title track is definitely a fantastic, original sounding piece that showcases “modern pop” at its best. Marillion fans have at least a year to wait for a new studio recording, but fortunately, we’ve got guitarist Steve Rothery’s new solo record, The Ghosts of Pripyat, to hold us over until that time. And really, his style is so recognizable that this release at once sounds like an instrumental album from the band he calls home. He is joined by members of his live solo band including Dave Foster (guitar), Leon Parr (drums), Yatim Halimi (bass), and Riccardo Romano (keys), plus a couple of notable guests including Steven Wilson and Steve Hackett. This is a musical album throughout, mellow in its overall vibe, and filled with beautiful instrumental melodies and slow grooves. Rothery’s lead guitar work is immediately familiar, as is his acoustic guitar work and melodic arpeggios with delay lines. The band is solid, and as with typical Marillion music, everyone is playing in support of the song, except that in the case of the solo work, Rothery’s guitar is out front and on top in all the right places. Great stuff. The Human Condition is the fourth studio album by Dutch symphonic metal band, Delain, which was formed by the former keyboardist of Within Temptation in 2002. The band does an excellent job of incorporating hard-hitting metal riffs and passages along with orchestral instrumentation, creating very catchy and lyrically driven music. Unlike other bands that fit within the same genre, Delain’s music seems to take a very condensed approach, where sections never drag on long enough to lose the listener’s attention, yet there is enough variety in the parts so that the songs never feel overly repetitive. The album sounds excellent, and the tracks feel very immersive thanks to a fantastic mix. Elements constantly enter and exit the foreground and there is always something layered in the background to fill up the space and contribute to the huge sound this band is able to achieve. The guitar tones are thick, rich, and absolutely crushing. You’ll probably feel like you’ve been smacked in the face multiple times throughout the listening process. Alan Parson's engineering series makes the leap from video to book! 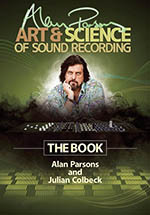 A couple of years ago, legendary recording engineer Alan Parsons released a fantastic DVD video series all about the… wait for it… art and science of sound recording! Now, for those of you who prefer a hands-on guide to sit at your desk, Alan and Julian have done a full re-write of the video series and presented it in book format. From this book, you’ll get a fantastic tutorial that covers a complete spectrum of recording and mixing topics, with lots of great commentary to support the more technical descriptions of various products or recording techniques. Part-time recordists and musicians will gain plenty of recording knowledge from reading this tomb of information, and it’s written in such a way as to not leap over the heads of those of you who want to get to the heart of recording technique without being put to sleep by the science. The Book covers everything from miking techniques to channel/input processing, popular recording tools (hardware and software), different approaches for different scenarios, and it has tons of photos and illustrations to help you learn. The book is, pretty much, a self-contained course on the basics of audio recording, though it goes well beyond basics—it covers a lot of territory. Whether you’re looking to brush up on your techniques, refresh your knowledge about specific aspects of recording, or if you’re just getting your feet wet, there is plenty for everyone to get out of this book. A fantastic, progressive-meets-classic rock masterpiece is what you’ll find in the latest release from the incredibly talented Mr. Morse and company. Typically, the virtuoso and multi-instrumentalist Neal Morse writes all of the material for his records, but here, he decided to perform an experiment—a grand one, if you will. Without writing any material in advance, he convened his band (err, make that his league of extraordinary musicians)—drummer Mike Portnoy, bassist Randy George, keyboardist Bill Hubauer, and newest addition, guitar player Eric Gillette (whom Mike Portnoy proclaims is the best guitarist he’s played with since “that other guy”)—and the intent was to write the entire album collaboratively and quickly. What they ended up with was two discs (the primary title plus an awesome bonus disc) worth of music that has a vibe that is a little bit Neal Morse, a little bit Transatlantic, more than a little bit CSNY, a little bit Kansas… you get the picture. Tons of ‘70s-tinged vocal harmonies (everyone in the band contributes), acoustic guitars, classic guitar riffs, and some modern, anthem-tinged rock. On The Grand Experiment, guitars are the primary driver, and the twenty-six minute long piece, “Alive Again,” even has a few sections where you’ll ask yourself what band is Portnoy currently playing with. Not to be confused with a full-on prog rock epic, The Grand Experiment has a few songs that fit neatly in the four to six minute range. Fans of traditional, ‘70s classic rock will easily embrace this album, so support these fantastic players and buy this one as a gift for your friends. As for the bonus disc… awesome! How they wrote so much music in just a few months is a mystery, and the bonus disc alone could easily prove a fan favorite. The opening track, “New Jerusalem (Freedom is Calling)” is a monstrous, modern, epic, gospel-tinged, ballad-meets-anthem that is just stunning, while the next track, “Doomsday Destiny” channels classic Genesis/Peter Gabriel before delving into some great instrumental jams. But wait… there’s more to follow, plus some great live recordings from the previous tour. Suffice to say you’re in for a real treat. This collection showcases rock musicianship at its finest. There’s inspiration to be drawn from every song, and we couldn’t rate The Grand Experiment any higher even if we wanted to. This new release from keyboardist Dave Kerzner is a welcome, atmospheric, progressive rock album from the keyboard player who co-wrote the fantastic Sound of Contact album with Simon Collins just a few years ago. Though very modern sonically, the synth textures, dense vocal harmonies, and guitar solos are at times extremely reminiscent of Pink Floyd. Kerzner takes over where we imagine Dave Gilmour left with the final Pink Floyd album, The Division Bell (The Endless River doesn’t really count as it was made from unused material tracked during the Division Bell sessions). As such, this album makes a great case for listening while relaxing with a nice set of headphones. You can expect a number of drastic changes in tone throughout the record, as well as standout performances from Kerzner as well as notable guests including guitarist, Steve Hackett. If you’re looking for new progressive music with a familiar, Floyd-inspired sonic palate, then New World should be next on your list. This is a quality release featuring seasoned and inspired musicians, and it should not pass under the radar. A work of art that brings you inside the world of one of the biggest bands in history. In Bon Jovi: Work, accomplished photojournalist David Bergman spent a few years in the life of the legendary band as they embarked on two world tours over the course of 2010-—2013, documenting everything from the front of the stage to behind the scenes off stage, in hotels, tour busses, hospital emergency rooms, and more. 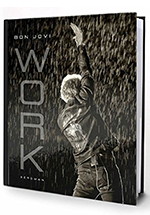 Work is an outstanding coffee table book that will appeal to many different audiences: Bon Jovi fans, rock and roll music lovers in general, and photojournalism photography enthusiasts. The collection of color and black and white photos is beautifully presented in this oversized, bound, hardcover edition, and Bergman did a great job of taking us behind the scenes, including both guitarist Richie Sambora as well as his eventual replacement, Phil X. This book truly captures the vibe of this band through its touring experience, and it is worthy of a place on your table or in your library of essential rock n’ roll books. This new supergroup (and we’re not using that term lightly) consists of an incredible group of musicians including Jack Blades, Deen Castronovo, and Doug Aldrich that you should recognize from classic bands including Journey, Night Ranger, Damn Yankees, and Whitesnake. I’m sure you can imagine that the pairing of musicians of this caliber and reputation would result in quite a spectacular album. Here, you will find blazing guitar solos and catchy vocals in a distinctively ‘80s style, but with modern production values. Revolution Saints’ eponymous debut EP is a must listen for any fans of the bands that bred these musicians, as well as anyone with a taste for catchy ‘80s hard rock. Let’s talk highlights: Doug Aldrich shreds! If you want to hear effortless soloing with impeccable tone from a guy who knows more than pentatonic minor, crank this album. And, Deen Castronovo’s vocals give Steve Perry a run for the money. There are really only two small problems that we have with the album as a whole. Firstly, Jack Blades of Night Ranger and Damn Yankees fame is seriously underrepresented as a vocalist throughout the album. His bass work is excellent and perfectly suited to the music, and his shared lead vocals with Castronovo on the single, “Turn Back Time,” add a fantastic flair to the vocals. However, he sings lead lines so infrequently over the course of the album’s twelve tracks that it seems like a huge waste of talent from a guy who sang on so many of the most successful rock hits of all time. The next “flaw” is the length of the album, falling into a trap that only old ‘80s bands can’t seem to move beyond. Though there are some incredibly well written songs and impeccable performances, Revolution Saints has a very specific sound, and after five or so songs, it gets a bit monotonous. The band seems to really be counting on their audience having a fairly long attention span, which as modern consumer trends indicate, isn’t the case (even the extremely patient and attentive editors at MusicPlayers.com get restless by the end). Late-album tracks like “Strangers to this Life” and “To Mend a Broken Heart” are great songs with serious potential, and it would be a shame if most listeners had their fill of the album by track six. Two shorter EP releases could have gotten them a bit more mileage in this era of shuffle play on the iPhone. Despite the inclusion of so much music, Revolution Saints are a band to praise, and their debut album deserves recognition for sounding fresh while at the same time clearly drawing from their ‘80s roots. This is one of the best albums that Journey never wrote. Guitar players, do you love to shred? Bassists, do you love to groove? Can you write catchy rock songs with huge vocals and show off your chops? Does your girlfriend get all weepy-eyed for classic power ballads? This is a re-release to purchase at once! Pornograffitti is perhaps the crown jewel in Extreme’s excellent catalog, and if you want to know why Nuno Bettencourt was one of the top three or four shredders of the ‘80s, look no further than this album. The Deluxe Edition re-mastering sounds great, and the collection of B-sides and alternate mixes make a nice bonus. If your only exposure to Extreme is their Greatest Hits collection, this is a must-have, as that collection is missing far too many treasures from this totally rockin’ album. This one is crank-it-in-your-car, fist pumping, head banging fun for the whole family, assuming they all love to rock.